Gaillardia is a North American genus of showy annuals and perennials grown for their profuse and long-running bloom and their utter indifference to heat and drought. They need well-drained soil and plenty of sun to do their best work, which includes very satisfactory performance as cut flowers. 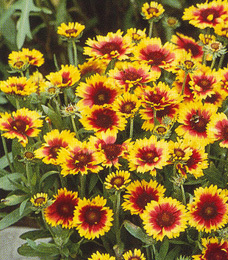 ‘Goblin’ is one with a somewhat shorter stature than other Gaillardia cultivars topping out at only 12 inches tall. This diminutive size does not affect its dynamic display of 4 inch diameter flowers that have dark maroon and gold centers surrounded by rich red petals that are trimmed in a ‘sweet corn’ yellow.